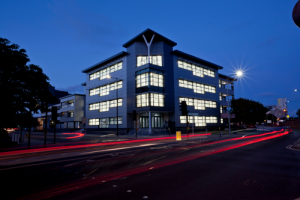 IYJI a specialist bespoke software development and DevOps consultancy has moved to the stunning new Grade A Connexions office building at Princes Street, Ipswich. “In tandem with our philosophy of recruiting top flight people we also want to offer them the very best working environment and Connexions fulfils our exacting criteria”. “The building offers superb accommodation which would suit a wide variety of companies but increasingly Ipswich is seeing the growth in activities by high tech and knowledge based businesses and we are very pleased to welcome IJYI who bring their cutting edge technologies to a contemporary high spec office”. Connexions extends to approximately 41,000 sq ft with opportunities for other occupiers to seucre space and suites from 4,500 sq ft to 11,500 sq ft with great on site car parking, balconies and roof terrace. There is also the added attraction of the building falling within the Enterprise Zone whereby tenants benefit from rates relief of up to £55,000 per annum for up to 5 years which represents a major saving in their property costs – further details on the other opportunities at Connexions available from either of the join agents.